That feeling you get, when you’ve finally made it to a viewpoint that looks out one of the most spectacular landscapes in the world – is simply indescribable. Landing in to Santiago, Chile (following a cheeky upgrade on the long flight from London), there was no doubt this was only the start of a very long journey for Mark and I as we looked at the route for the rest of the day. Having made the decision to travel to the Andes off season, I had a feeling a few of the “guarantees” (such as, being able to actually get to where we wanted) were not on the cards, but after a chaotic flight down to Punta Arenas, and a lot of paperwork for taking the car to Argentina later, we were finally on the open road. We’d been relatively lucky, it seemed : The true harshness of winter hadn’t quite set in, and despite the region being somewhat reduced in terms of services (most tourists stay away after May each year) that initial drive along the coastal roads towards Torres Del Paine National Park treated us to wide open roads, golden fields and a soft pink sunset that lasted for hours. We’d been lulled into a false sense of security, however. As darkness fell, the roads into the park began getting icier, sometimes dangerously so. Our route was littered with closed roads (apparently being remade now the main season was over), resulting in unknown diversions across mud and rock tracks where roads, I’m sure, once were. We had planned for the journey to take 4.5 hours; 7.5 hours later, we arrived. Making our way across the rickety wooden bridge to our hotel for the next few days, with tons of luggage and equipment in the pitch black of night was “interesting”, but nowhere near as interesting as our rooms were at the Hosteria Pehoe hotel, right on Lago Pehoe, overlooking the mountain peaks of the National Park. While the beauty of its location could never really be criticised, as a relatively expensive hotel for the area, the upkeep of our “luxury, upgraded rooms” was an absolute disgrace. From the (human?) fluid stained sheets, to the doors with no seal from the freezing cold outside, broken radiators hanging off the walls, mould, dirt and generally disgusting state of the property, this ranked up there with one of the worst hotels I’ve stayed in for a long while – and I’ve stayed in some horrific places in China before! Still, we were here, and what an amazing view there was in every direction I turned. Jetlag can be a help when you’re looking to be up early in the morning, as can a freezing cold draft hitting you from all angles during the night it seems! 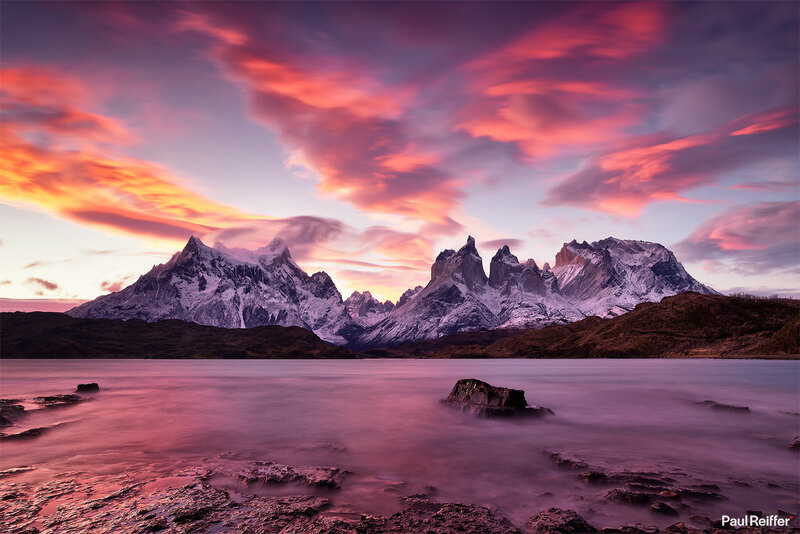 While the sunrise time was rather leisurely at this point in the year, a quick hop up to the top of Hosteria Pehoe’s island provided me with my first view of Cerro Paine Grande – one of the highest peaks in the Chilean side of the region. Sadly, the sunrise didn’t hit that magical pink/orange glow I was looking for to start with; the cloud level sat right on the mountains in front of us and on the horizon in the distance, blocking the sun’s rays. What was happening, however, was the cloud deck was starting to move quite rapidly along the lakeside – it may have been too late for a colourful sunrise, but I was certain it was still possible to get a morning shot of this amazing view. Remembering one of the hills we’d driven past the night before (which had been under a thankfully clear sky), it was time to drive up and see if we could get a better perspective. I guess we did! 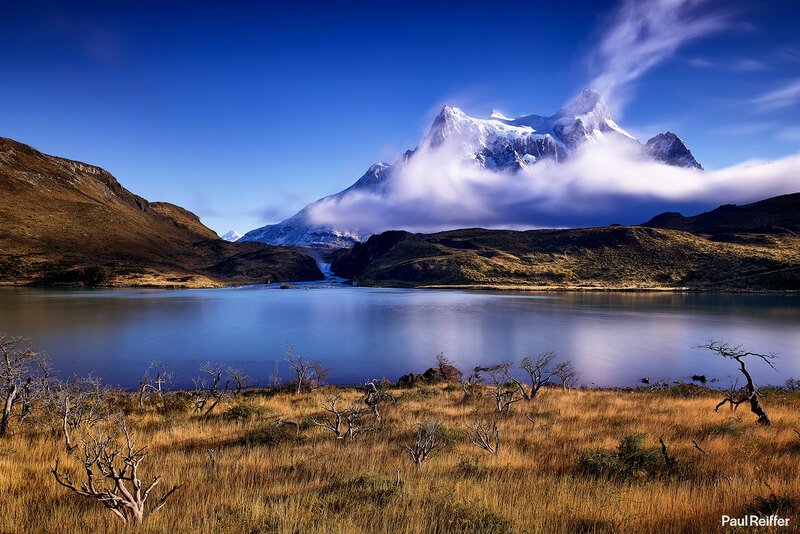 That panoramic vista, looking out across Lake Pehoe, with the little hotel on the island in the foreground, all overlooked by Cerro Paine Grande and Torres Del Paine in the distance was nothing short of awesome. With lungs full of the crisp winter air, and inspired by that one single view within hours of waking up on day 1, it was time to explore further into the park. 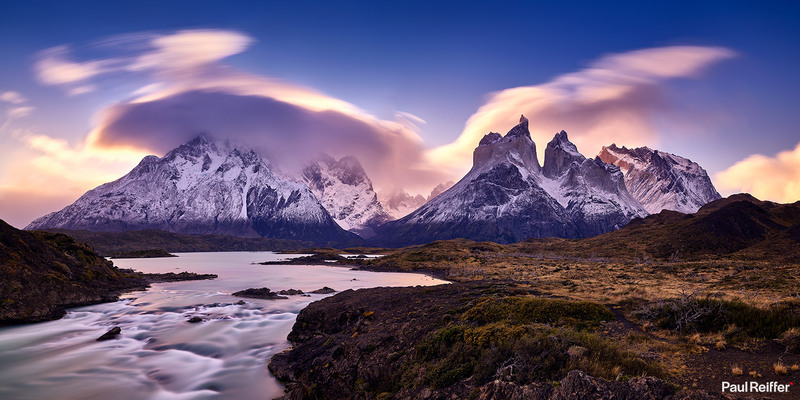 Many “adventurers” in Patagonia tend to gravitate to the “W Trek” – a well-trodden loop of hikes that take in some of the key viewpoints around the mountains. Hiking up to 15 miles a day for 7 days with 30kg of camera gear in the peak tourist summer months is a challenge. In the winter, however, it’s just considered madness. Opting for shorter ventures from the roadside, up to an hour round trip by foot, we decided to take the relatively comfortable route when it came to exploring further afield. While it could be claimed that these locations were hardly “off the beaten path”, on the flip-side, I’d argue the (very much) beaten path of the W trek could be considered no better in that sense. 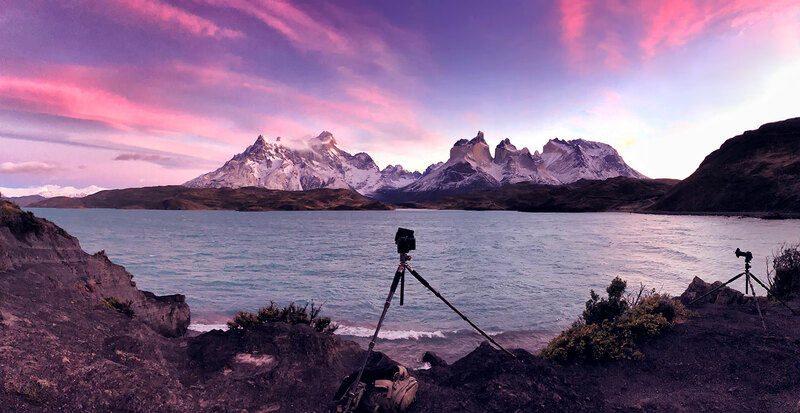 Sadly, in my opinion, Patagonia has already now fallen victim to the global photographer’s must-do tick list, with the entire area being set up for fabricated natural “experiences” and the need to be a world explorer for the sake of social media. In reality, there is simply no place in this park that I didn’t look at and think “wow”. Sure, heading deeper into the mountains (as we did in Argentina, more to come on that later!) 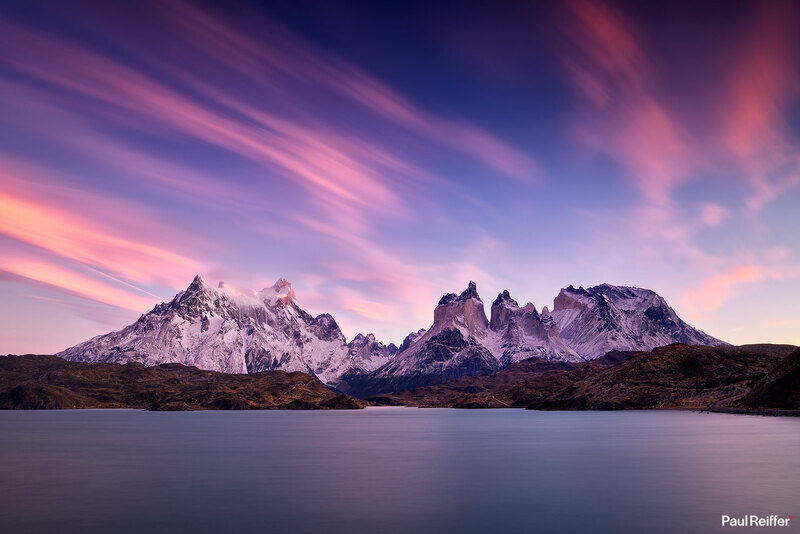 gives you a different perspective, but the sheer beauty of this mountain range can be experienced from wherever you are in Torres Del Paine National Park. With sunrise in our sights, day 2 gave us the opportunity to catch the sunset I’d pictured in my head the day before. While sunrise on day 1 had been relatively cold, our experience in the unexpected warmth of the sunshine throughout the day had lulled us into a false sense of security. As you get closer to the mountains themselves, the cooler air running through the valleys and across the glaciers really does make itself known as it hits your face, already covered in freezing cold mist from the waterfall below. Add to that the moment when that temperature plummets immediately after sunset and you have a recipe for frozen human beings. Being used to sitting out in the cold for hours on end does come with its advantages, however, and this would be one such occasion. As the sun lit up the flow of cloud forming across the mountain range from its place on the horizon, it was time to take my hands out of the two pairs of gloves and hand-warmers I had stashed safely in my pockets. Capturing such a vast view with a single shot as a great reminder of how incredible the Phase One XF and IQ3 Trichromatic combination still is. Zooming in to the distant mountain detail revealed features I hadn’t even noticed with my own eyes. 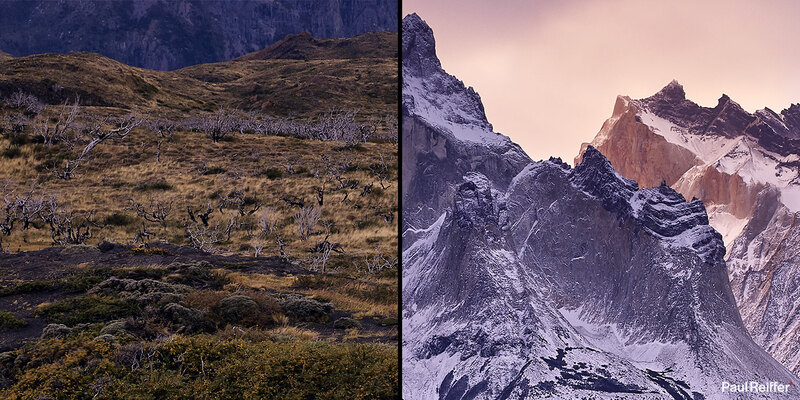 Here’s a 50% crop from that image above, showing some of the incredible structures within Torres Del Paine itself. The next morning – not so good. The weather had started closing in, meaning shots were going to be difficult today – but there was another problem : Fuel. Torres Del Paine National Park doesn’t actually have any form of official petrol stations or gas for sale within the park boundaries. Allegedly, there are certain places (such as Rio Serrano) which have “a guy who might sell you some”, but otherwise you’re out of luck. We headed out in the hope we could find “a guy”, stopping off at one of the only places that remained (half) open – Camping Lago Pehoe. While the friendly gentleman there didn’t have any fuel, he did have some supplies – 6 small bottles of water, 1 large bottle of water, 1 large coke and 2 packs of (evidently, rebadged) M&Ms for USD$61. Bargain! Given the nearest fuel stations outside of the park were around 100km away, in a gas-guzzling 4×4, the mathematics told us we now had to keep going to allow us to both continue shooting around the park, as well as make our way to Argentina in a couple of days’ time. Time to get back on the road, and with the winter daylight hours, sunset would be hitting shortly after we arrived back to the hotel. Allowing for a bit of time to explore a slightly different location than the top of the hill, we got to the water’s edge to find the wind had cleared the sky just enough for the sun to start delivering some great colour above us and the mountain range. One problem with that helpful wind, however, was its unhelpful side effect of blowing my camera, tripod, filters and bag in every direction with determined force. Wanting to grab a long exposure in these conditions presented an almost impossible puzzle, but somehow – between the odd failed frame – I managed it. And what a truly amazing sunset we were treated to that evening. This was Patagonia. The sheer scale of nature’s building blocks laid out before my camera. 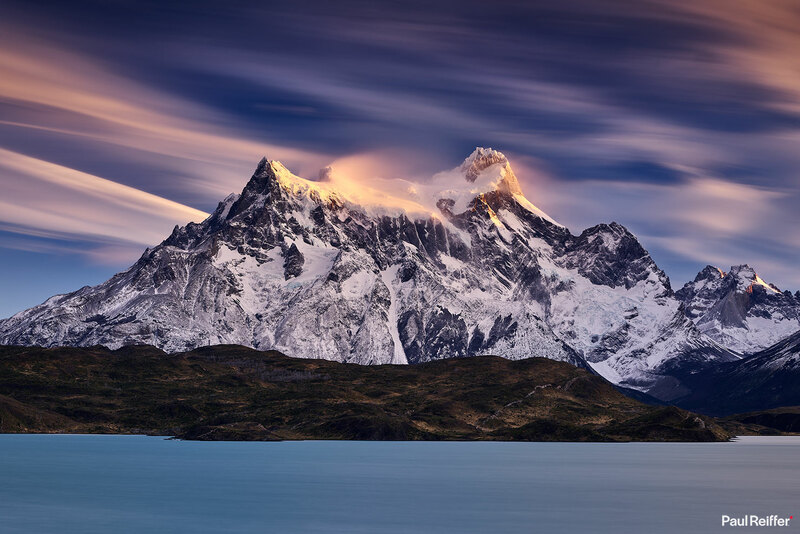 Snow-capped mountains set against a pure glacial lake, with the sky on fire from above : Simply magical. With one last morning remaining, sat happy with my sunset shot from the night before, there was one final opportunity to get my sunrise shot of that same amazing view. With the clouds co-operating this morning, this was looking like it could be the photograph I’d been hoping for. You could sit for hours at that overlook, and just marvel at these huge mountains across the lake. As the sun rose, the colours in the sky shifted from pinks, to reds, oranges, and the warm yellows of early morning daylight. Switching to a 150mm lens, just after the colour began to fade off, I managed to capture the rolling winds scooping the snow from across the mountainside and brushing it over the peak of Cerro Paine Grande. Even without the photograph, what a great sight it was to finish our last morning in this first location. Frozen pellets of pure ice. It’s one of the strangest things I saw in Chile, surrounding the entire circumference of the lake itself. Probably quite the refreshment for those who wanted to “cool down” in these sub-zero temperatures too! So it was “goodbye, Chile” – for now. Back on the road for a few hours with a full tank of gas and our mountain of paperwork for the Argentinian border, that was my capture time in Chile coming to an end.